The deep record realms of the Nightmare contain dungeons filled with extremely powerful foes. Can only be entered during a certain time each month. There are twelve Nightmare Records in all, and each month a new one becomes available. If you can’t complete a Nightmare dungeon during the time it\’s available, you can try again the next time it is open. 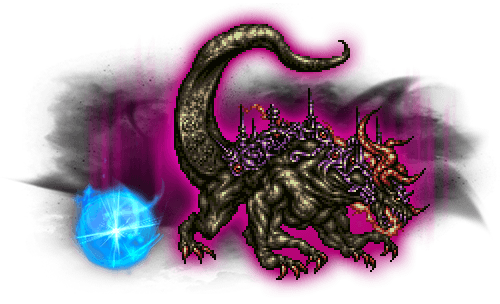 Complete the North Mines classic dungeon in the FF VI realm to unlock the Nightmare dungeon. As Dr. Mog continued his research into the vanishing records, he stumbled upon a tome that spoke of vast ruins deep underground, known as the Nightmare. The Nightmare contains twelve powerful records, but like the records in the paintings in the Royal Archives, these too have begun to fade. 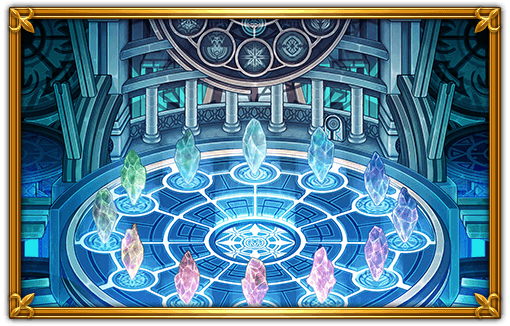 According to Dr. Mog, if all twelve Nightmare Records can be restored, it will be a vital step toward uncovering the truth behind the event that led to the record crisis. 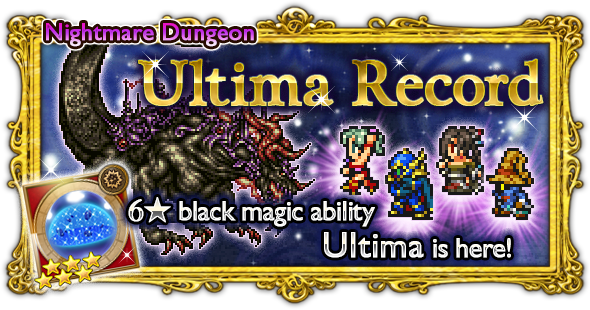 Ultima is a 6★ Black Magic that will be made available to craft. 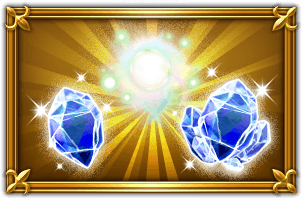 To craft it, you will need: 10x Black Crystals, 6x Non-elemental Crystals, 6x Fire Crystals, 1x Ultima Record. What you see is the Bolt Armlet. It is one of the rewards in this special “event”. It gives major resistance to lightning damage. In this series there will a total of five dungeons, the four that you see above, plus a fifth one which will be covered shortly. These four dungeons have their own respective realms, so take advantage of Realm Synergy! You can also take them down in any order that you prefer. Clearing the four dungeons will unlock the final Nightmare dungeon. 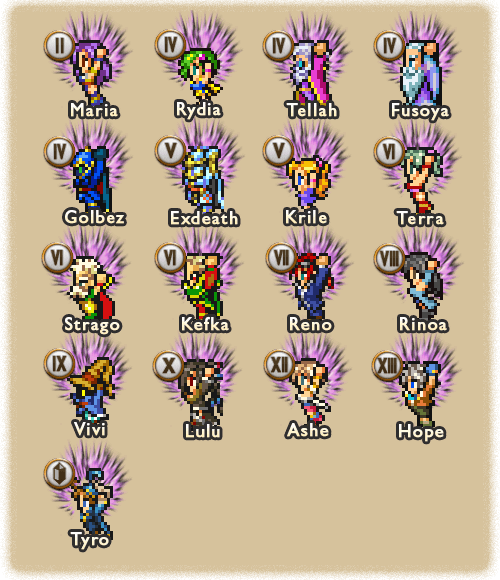 The following heroes get a Nightmare Shift bonus in the final dungeon, Ultima Buster (Nightmare). Nightmare Shifted heroes get stat and equipment bonuses, and earn extra experience points. Defeat Phantom Train without being KO’d. Exploit Phantom Train’s weakness to fire attacks. Exploit Phantom Train’s weakness to lightning attacks. Acid Rain: Deal moderate water damage and Sap all targets. Saintly Beam: Deal moderate holy damage to all targets. Diabolic Whistle: Poison, Confuse, Slow, Blind, and Doom all targets. Wheel: Deal physical damage to one target. Start with mitigation (SG/SS2) and go all out with fire/lightning/holy moves like spells and spellblades. Phantom Train is an Undead so you can use Curaga/Curaja to deal decent holy damage to it. You may want to bring Esuna because Diabolic Whistle is something you have to worry about. Defeat Spherimorph without being KO’d. Exploit Spherimorph’s weakness to lightning attacks. Exploit Spherimorph’s weakness to ice attacks. * Spherimorph changes elemental weakness each time you hit it with an element it is weak to. Press: Deal heavy damage to all targets, proportional to their HP. Watera: Deal water damage to all targets. Water (Counter): Deal water damage to one target. Water (Counter): Deal water damage to all targets. Thunder (Counter): Deal lightning damage to one target. Thunder (Counter): Deal lightning damage to all targets. Blizzara: Deal ice damage to all targets. Blizzard (Counter): Deal ice damage to one target. Blizzard (Counter): Deal ice damage to all targets. Fira: Deal fire damage to all targets. Fire (Counter): Deal fire damage to one target. Fire (Counter): Deal fire damage to all targets. When Spherimorph is hit with an element it’s currently vulnerable to, it uses its Elemental Shift ability to randomly change its vulnerability to lightning, water, fire, or ice. Spherimorph counterattacks with the opposite element of its new weakness. Once you find its weakness, use a non-elemental attack (preferably Magic Breakdown and/or Full Break) to reveal its new weakness through its counterattack. To master you need to fulfill all the target scores. Also, Press cannot be mitigated, so be ready to heal a significant amount of damage. Make sure you keep Shellga and SG/SS2 up as well. Defeat Dreadnought without being KO’d. Wrecking Ball: Deal heavy physical damage to one target. Wrecking Ball: Deal heavy physical damage to all targets. Flame Spreader: Deal heavy fire damage to all targets. Pulverize: Remove debuffs from one target. Steam Clean: Deal physical damage to one target. In its Normal form, Dreadnought periodically checks itself for debuffs. If it has any debuffs, it enters Steam Clean form. In its Steam Clean form, Dreadnought uses Steam Clean to remove any debuffs. Dreadnought returns to its Normal form after a certain number of turns. Use attacks that inflict debuffs to trigger its cleaning mode, then start hammering him with your hardest hitting moves while he’s busy steam cleaning. Unlike the previous versions of Dreadnought that we have fought, this one’s immune to Paralyze. Recommended abilities: Blindaga, Slowga/Dual Delay, Breakdowns. Defeat Liquid Flame without being KO’d. Exploit Liquid Flame’s (Human Form) weakness to ice attacks. Exploit Liquid Flame’s (Tornado Form) weakness to ice attacks. Rush: Deal physical damage to one target. Blaze: Deal heavy damage to all targets, proportional to their HP. Ray: Deal physical damage and Paralyze one target. Refrain from using physical attacks as it will counterattack (except in Tornado Form), use magic attacks or resort to Retaliate + Draw Fire. Be patient and wait for him to switch forms to fulfill target scores. Hit Mana Sphere with fire attacks. Hit Mana Sphere with water attacks. Hit Mana Sphere with non-elemental attacks. Fire/Blizzard/Thunder: Deal fire/ice/lightning damage to one target. Fire/Blizzard/Thunder: Deal fire/ice/lightning damage to all targets. Nigh Laser: Deal special physical damage to all targets. Flare Star: Deal heavy fire damage to all targets. Nightmare Ultima (0): Deal non-elemental damage to all targets, ignores RES. Nightmare Ultima (1): Deal moderate non-elemental damage to all targets, ignores RES. Nightmare Ultima (2): Deal heavy non-elemental damage to all targets, ignores RES. Nightmare Ultima (3): Deal very heavy non-elemental damage to all targets, ignores RES. Nightmare Ultima (4): Deal massive non-elemental damage to all targets, ignores RES. Nightmare Firaja: Deal heavy fire damage to one target, ignores RES & buffs. Nightmare Blizzaja: Deal heavy ice damage to one target, ignores RES & buffs. Nightmare Thundaja: Deal heavy lightning damage to one target, ignores RES & buffs. Southern Cross: Deal heavy fire damage to one target, ignores RES. Fire Deal damage to Ultima Buster equal to 10x the amount of damage Mana Sphere received. Lightning Deal damage to Ultima Buster equal to 10x the amount of damage Mana Sphere received. Holy Mana Sphere takes heavy damage, deal reduced damage to Ultima Buster. Dark Mana Sphere takes heavy damage, deal reduced damage to Ultima Buster. 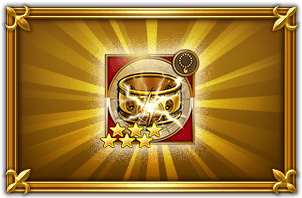 Non-Ele Mana Sphere takes heavy damage, deal reduced damage to Ultima Buster. This fight is split into three main phases. In this phase Ultima Buster is not very threatening, but he can still hurt so put up a mitigation where necessary. Phase 2 starts after dealing ~35000 damage to Ultima Buster. In this phase, a Mana Sphere will appear. At the same time, Ultima Buster gains Reflect. Phase 3 begins when Mana Sphere is destroyed or when Ultima Buster gains 4 charges of “energy”, this will be discussed shortly. 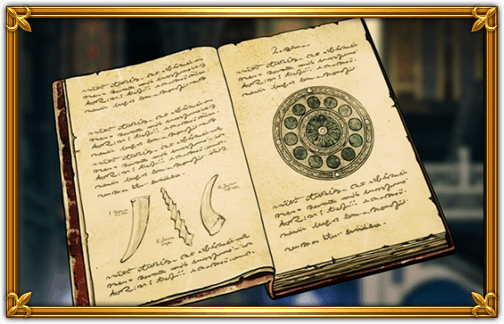 As mentioned in the Abilities section above, Mana Sphere will react depending on what element abilties you use on it. You’re going to have to utilize the mechanics of the Mana Sphere to win this fight. Only fire and lightning elements will cause Mana Sphere to deal massive damage to Ultima Buster. Do note, however, that you still need to hit it with water and non-elemental attacks for the target score. There is also another important thing to note in phase 2. Every turn (or few turns? ), Mana Sphere will grant Ultima Buster one charge of “energy” (this is represented by a ‘sparkling light’ on Ultima Buster). When Phase 2 ends (when Mana Sphere is destroyed or when Ultima Buster has gained 4 charges of “energy”), Ultima Buster will cast Nightmare Ultima which ignores RES, and its potency is increased for every ‘sparkling light’ it had when Phase 2 ended. Generally you want to aim for 2 ‘sparkling lights’ when Phase 3 starts so you don’t get screwed over by Abyss Ultima, with mitigation up maybe you can tank a 3-charge Nightmare Ultima, but you definitely do not want a 4-charge one. Now this is where you choose between the two main strategies. A huge deciding factor is by how great your gear is and how honed your fire and lightning spells are. One interesting thing to note is that you can actually make use of multihit elemental Soul Breaks which will cause Mana Sphere to inflict multiple hits on Ultima Buster. Watch Video #5 below. TLDR: I recommend ending the fight in Phase 2, hone your fire and lightning spells well! You do not want to see Phase 3! Assuming you went for the Phase 3 Kill strat, you will have to see the third and most dangerous phase. In this phase, Ultima Buster’s attacks ignore buffs and RES, so his magic will most likely one-shot anyone. This is where Aerith’s SSB comes in handy. Aerith’s SSB heals your party and grants each one Auto Life (or Reraise). Make sure you use it before Phase 3 starts. If you don’t have access to Aerith’s SSB, a great alternative is the Phoenix summon. That should cover most of the things you need to know about this fight. Recommended abilities: Shellga, as many fire/lightning attacks.